The inviting Central American nation of Belize is best accessed through its port capital, Belize City, which rests on the country's peninsula in the Caribbean Sea, and nearby San Pedro Town. A favorite hub of cruise ships by the dozen, this warm and inviting area is the best way to access this friendly home to caves, archaeological treasures, and the sole manual swing bridge anywhere in the world! Did you know that Belize City was once the capital of the former British Honduras? Its central location, now so convenient for travelers and investors, made it a prime place for trade and diplomacy before it reverted to local control. 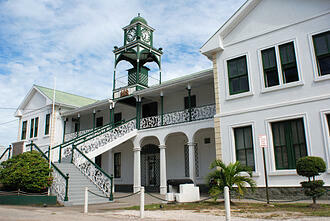 In fact, Belize City was so important that it was said of the town, "The Colony is the Capital." Now, visitors can see the old colonial buildings and roads in their vintage splendor. Strike out on a day trip from Belize City to visit the variety of temptations in San Pedro Town where glorious beaches invite you to relax and sunbathe while the many boutiques, bazaars, and cafes await your inspection and enjoyment. Speaking of San Pedro Town, you wouldn't want to miss the San Pedro Lobster fest in June, the best place to try the delicious Caribbean Spiny Lobster, which calls the waters around Ambergris Caye home. In fact, summer is the prime time to visit for many exciting festivals! An important aspect of enjoying a foreign land is being able to fully relax, knowing that its economy is solid and stable. Belize fits this perfectly and is a favorite place for retirees, investors and corporations to do international banking. Tourism is king here, industrial infrastructure is booming and real estate is hot. This vibrant economic activity makes for secure banks. Click here to learn about the ways that many Americans are taking advantage of this financial atmosphere to protect and even grow their assets. How about that real estate? Can you picture yourself in a home surrounded by palm trees, soothed by ocean winds, maybe near enough to the beach to stroll there every day? Ambergris Caye is one of the loveliest places you'll find anywhere, and not only can people buy homes and land there, but those homes and land also make excellent real estate investments. Whether your interest in beautiful Belize is for a vacation, for a new life off the beaten path, or for investment and protection of your money, it is a place that must be experienced. Fortunately, there are many expats and investors who would be only too happy to share their experiences with you, and this blog catering to Belize enthusiasts from all walks of life with a variety of financial and lifestyle goals is a great place to get your journey started.